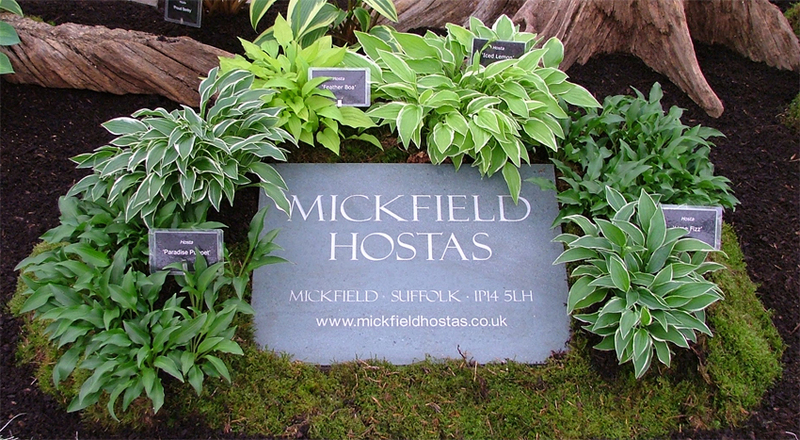 One of the benefits of exhibiting Hosta at shows is to illustrate planting combinations, and how you can create a wonderfully varied border using just one genus. Herbaceous borders can take a lot of maintenance to keep them looking lovely. If you grow a lot of Hosta together they can look fabulous and, because there isn't the constant shedding of decaying flowers and leaves, they naturally attract less pests. If you place a few jars on their sides with some slug pellets in each, in the darkest recesses of the bed, you will target any snails that do wander into the area. Beer traps work quite well in these conditions but the smell can attract more of a problem, rather like scattering pellets - use the pellets in the jars, it works. Also, if you have no love for the flowers, removing them helps minimise the risk of attracting pests, and it tricks the plants into thinking their season isn't yet over! 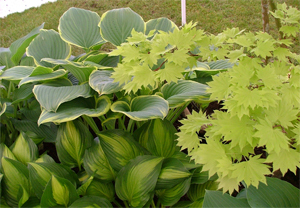 The dappled shade created by maples is excellent for keeping the worse of the weather off your Hosta. 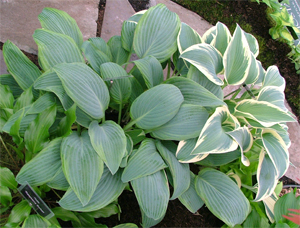 However, the biggest advantage of growing Hosta under trees is the fact that they are constantly shedding decaying material. Woodland floors are constantly littered with debris, which is what pests feed on. It is the converse idea to the one mentioned previously, but if you have too many pests they will also munch your fresh vegetation. The answer to any pest problem is balance, because the garden needs pests, as do the wildlife that predate on them. However, too many pests and you will need to intervene with the little glass jars. Some combinations work really well because the plants are related. 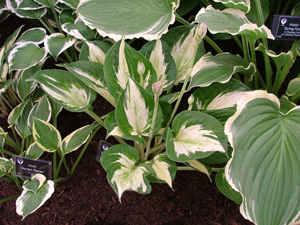 A particularly gratifying branch of the Hosta genus to play with is the Tardiana group, which includes such favourites as H. 'June' and H. 'Touch of Class'. Selecting different branches of the genus to display together is something we like to do in Plant Heritage displays because it helps illustrate the characteristics shared by those plants more closely related to each other. In 2014 we experimented with spiral designs of planting and used a selection of small and miniature varieties to taper off the spiral mounds. Here we used several varieties with round leaves to carry through the theme: H. 'Shade Parade' , H. 'Blue Mouse Ears' and H. 'Vanilla Cream' complete the tip of the spiral. These particular varieties would naturally remain in context with each other, size wise, over time. 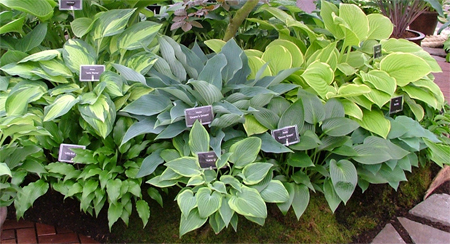 Despite the fact that these days there are so many colourful cultivars to choose between, many people still consider all Hosta look the same! We often stand bewildered when asked why this is the case, but perhaps what is really meant is that they are so complimentary no one variety stands out from another? You can be sure this comment is even made whilst standing beside varieties so colourful, no other foliage plant could come close - we are talking about H. 'Orange Marmalade' in its full spring glory! 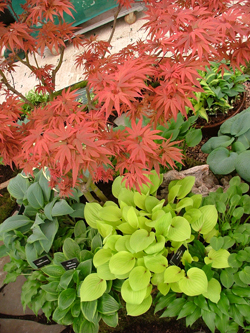 This is a particularly lovely combination of plants with similar leaf shapes but different textures and colours. 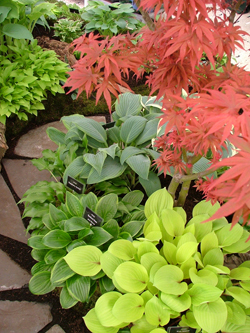 H. 'Blue Boy', the rich dark, shiny green leaves of H. 'Devon Green', the chartreuse and blue-green variegation of H. 'Katie Q', the glossy, wavy-edged leaves of H. 'Little Red Joy' and the beautiful variegation of H. 'Julie Morss'. From 2016 we moved to creating educational displays, which looked at different branches of the genus and highlighted specific species and cultivars responsible for its development over recent years. This involved group planting related plants to illustrate specific characteristics and it shows how they can still complement each other when similar. All these displays have been captured on video, together with lists of the varieties used, via our video clips page. 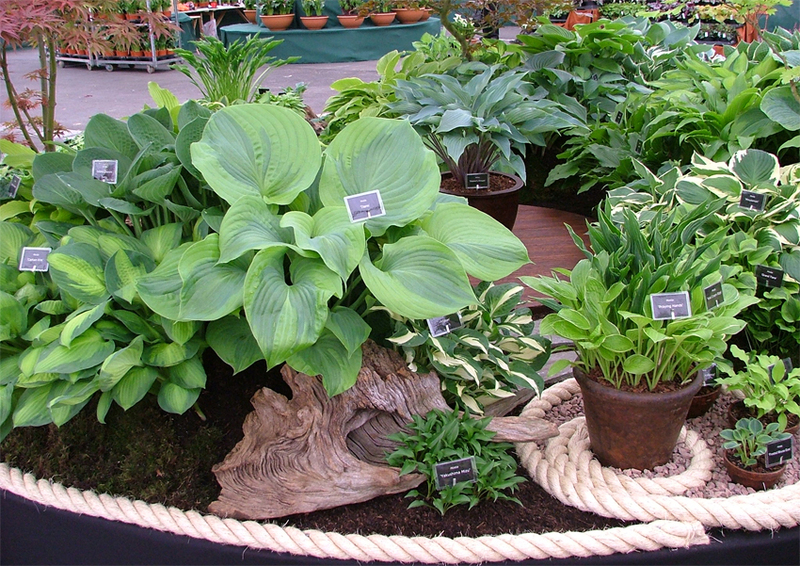 The rapid increase in the number of different small and miniature varieties over recent years has opened up new possibilities for gardeners, with much more modest spaces, to use Hosta in their planting schemes. We like to pop these little gems into nooks and crannies we create in our displays but sometimes they deserve a stronger billing, like we did here, yet again at the 2012 Gardeners' World show - opposite. H. 'Feather Boa' and H. 'Iced Lemon' around our slate sign - click on the image to view larger. We have some truly magnificent giant varieties, many originating from H. 'Sum and Substance', which have dustbin-lid sized leaves with a particular sheen that just grabs the eye. This year we used H. 'Titanic' at Gardeners' World and it stole the show. 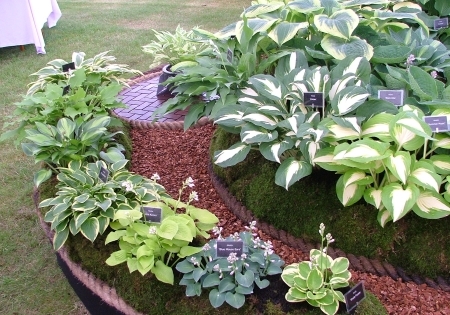 The use of such a giant leaved variety among the detailed planting surrounding throws the variety of the genus into sharp relief - it certainly inspired visitors to the stand to try something similar in their gardens, and there is a wealth of giant leaved varieties to choose from. H. 'Titanic' is underplanted with H. 'Vulcan' to the right, bog oak and H. 'Yakushima Mizu' in the foreground. H. 'Captain Kirk' sits to the left underneath H. 'Fortunei Obscura' (H. 'Bella'), at the back of H. 'Titanic'. A selection of pots sit in the coil of rope - simple but very effective. If any of our ideas inspire you, don't forget you can select specific plants using our search resource. Simply click on the dominant leaf colouring you desire and those varieties with that leaf colouring are listed in order of size, the variety links are colour-coded according to the flower colour.